We are SO excited to announce a new upcoming performance! 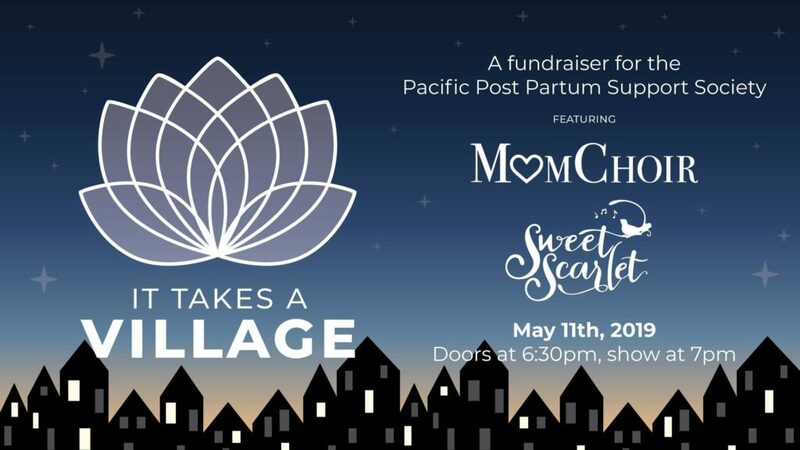 “It Takes A Village” is an evening of story-telling, laughing, crying and a double-whammy of empowered song by MomChoir & Sweet Scarlet- all in support of the Pacific Post Partum Support Society. Intermission: Bring cash to buy raffle tickets for some incredible gift baskets! Motherhood is a journey. For many of us, it begins with the first little plus sign on a pregnancy test – our indicator that we are plus-1 (or 2, for some), and after that, the journey never really ends. There is no set destination, no hard and fast rule that lets a mom know she’s arrived. Often, along the journey, we hit snags, snares and successes. We lose parts of our identity, only to pick up new fundamental pieces of ourselves. There’s an old adage that says It Takes A Village to raise a child – but if we’ve learned anything on our journeys, it’s that It Takes A Village to be a mother. From our beloved friends and family, to the clubs (and choirs) we are a part of, to life-saving organizations like Pacific Post Partum Support Society, each of us needs our own village. And on May 11th – we want to celebrate that with you: our village. This is a show exclusively put on by mothers and we can’t wait to see you there!